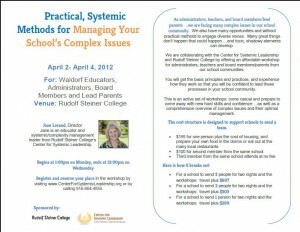 As administrators, teachers, and board members/lead parents….we are facing many complex issues in our school community. We also have many opportunities and without practical methods to engage diverse voices. Many great things don’t happen that could happen….and toxic, shadowy elements can develop. You will get the basic principles and practices, and experience how they work so that you will be confident to lead these processes in your school community. This is an active set of workshops: come casual and prepare to come away with new hard skills and confidence….as well as a comprehensive overview of complex issues and their optimal management. Check in with those who attended in January if you want validation that Jane Lorand offers an exciting style of learning and new insights. The cost structure is designed to support schools to send a team. $195 for one person plus the cost of housing, and prepare your own food in the dorms or eat out at the many local restaurants. Begins at 1:00pm on Monday, ends at 12:00pm on Wednesday. Pre-registration required. Call 916-864-4858 to register now.